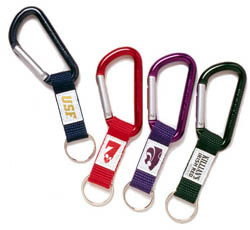 Carabiner keychains manufacturer and discount supplier of promotional carabiners for all occasions. GREAT DEALS ON CARABINER KEYCHAINS.....Check back monthly for more savings! Personalized carabiner keychains feature our popular large carabiner with nylon strap and custom imprinted label. The carabiners and straps are available in many cool colors. Strap imprint available in full color. Add a phone number or web address with optional laser engraving on clip. PERSONALIZED CARABINERS AS LOW AS $1.55 ea! Personalized Carabiner Keychains are Lowest Price Guaranteed! -Optional laser engraving on clip:$0.25 ea. -Second side engraving: $0.25 ea. Thanks so much for your help and service. The order was received on time and looks very professional. Looking forward to dealing with you in the future and will definitely recommend your service.